PVH Corp., one of the world’s largest apparel companies and owner of iconic brands including CALVIN KLEIN, TOMMY HILFIGER, Van Heusen, Speedo, Warner’s and IZOD, today announced its global participation in three important initiatives focused on accelerating the transition to a sustainable fashion industry based on circular economy principles. PVH recognizes its role in moving the apparel industry in a positive direction and sees opportunities to reduce waste and pollution through collaboration and partnerships. PVH has joined the Global Fashion Agenda, Fashion for Good and the Ellen MacArthur Foundation Make Fashion Circular Initiative. The mission of these organizations directly aligns with PVH’s corporate responsibility strategy to create positive impacts across its entire value chain, focusing on initiatives and business models that will have the greatest potential to transform the industry. As part of these new partnerships, PVH will set circularity targets across all of its businesses. GFA is a non-profit initiative founded in 2016 with the goal of setting a common agenda for focused industry efforts on sustainability in fashion. 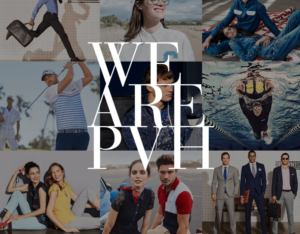 Tommy Hilfiger was PVH’s first business to sign the GFA 2020 Circular Fashion System Commitment, which it did in 2017; the Commitment has now been signed by PVH on behalf of all its businesses. As a signatory, PVH and its businesses are making a pledge to set specific targets to be accomplished by 2020 and report on progress annually. The pledge itself addresses four areas: designing for circularity, increasing the volume of used garments collected, increasing the volume of used garments resold, and increasing garments made from recycled post-consumer textile fibers. GFA will support PVH in achieving its commitment through knowledge-sharing activities, policy engagement and industry alignment. FFG is a global platform for sustainable innovation, providing promising start-ups needed access to the funding and expertise required to drive a scalable shift to more sustainable production methods. The FFG Innovation Hub works both to accelerate early stage companies, as well as to provide bespoke support to companies further along the path toward sustainability who are looking to achieve scale. FFG also acts as an advocate for change, creating open-source resources, such as a co-working space and the Fashion for Good Experience to join the collective movement to make fashion a force for good. PVH will join Fashion for Good as a principal partner, which will include helping to drive systemic change in the fashion industry, access to the Fashion for Good Experience and a board seat. PVH will play a leading role in setting FFG’s innovation agenda, defining focus areas, participating in the selection of new innovators, and providing expertise and mentorship to circular apparel startups. The Ellen MacArthur Foundation has been focused since its founding in 2010 on working with businesses, government and academia to accelerate the transition to a circular economy. The Foundation’s Make Fashion Circular Initiative, which launched in 2017, brings together stakeholders in the fashion industry to adopt a circular vision that reimagines the current take-make-dispose model. The goal of the initiative is to establish a new fashion system based on three circular economy principles: business models that keep clothes in use, materials that are renewable and safe, and solutions that transform used clothes into new clothes. As a core partner and member of the initiative’s Advisory Board, PVH will collaborate with Ellen MacArthur Foundation to address issues that lead to preventable pollution and waste in the industry, and deliver solutions to meet the changing global demands and societal expectations. With a history going back over 135 years, PVH has excelled at growing brands and businesses with rich American heritages, becoming one of the largest apparel companies in the world. We have over 36,000 associates operating in over 40 countries and nearly $9 billion in annual revenues. We own the iconic CALVIN KLEIN, TOMMY HILFIGER, Van Heusen, IZOD, ARROW, Speedo*, Warner’s, Olga and Geoffrey Beenebrands, as well as the digital-centric True & Co. intimates brand, and market a variety of goods under these and other nationally and internationally known owned and licensed brands. Hey Buddy!, I found this information for you: "PVH Corp. Accelerating Adoption of Circularity to Reduce Waste in Apparel Industry". Here is the website link: https://www.duurzaam-ondernemen.nl/pvh-corp-accelerating-adoption-of-circularity-to-reduce-waste-in-apparel-industry/. Thank you.